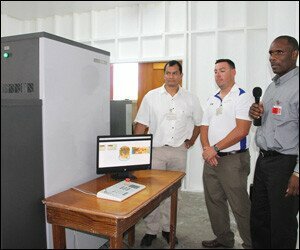 In its continued effort to fight crime and step up border security, the Nevis Island Administration (NIA) invested over EC$200,000 for the purchase and installation of an ADANI x-ray machine at the Long Point Port. It will be used by the Customs Department to examine all cargo entering the island there. “The only way we can do that is to have proper control over our borders, proper control over what is entering our ports and therefore, even though it might seem a high figure we believe in these circumstances it is quite worth the expenditure,”Â he said. “It’s a new process and something we feel we had to do, if we are to gain full control of all the items entering our borders. “We have had some difficulties over the years in terms of proper examination of cargo and all of these are designed to move toward a system where we can be sufficiently satisfied that we are taking the necessary steps to do a complete examination of all items entering our countries,”Â he said.